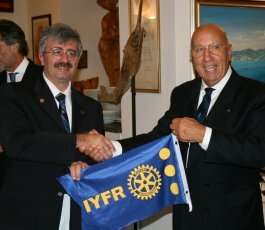 At the D2030 IT Fellowships Conference held in Vicoforte in 2006, Rotarian Sergio Santi, a former Italian Navy Naval Aviator, noticed that the north of Italy was missing a Rotarian Fleet that could have gathered all the Fellow Mariners of at least three Italian Districts, living and operating in the area . Having spent more than thirty years at sea as a Naval Officer, being born in a sea town and apart for a short time, having always lived in strict contact with the sea, Rotn. Captain Santi has enthusiastically answered to the Governor Gino Montalcini’s request to try and get organized in a Fleet. 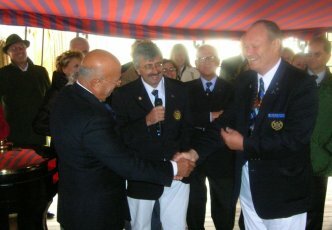 Fellow Mariners were to be found among all those Rotarians living, or having a floating device, or simply sea-lovers on that long coastal strip that, starting in proximity of Ventimiglia at the Italian/French border, arrives to Orbetello and to the Argentario Peninsula. 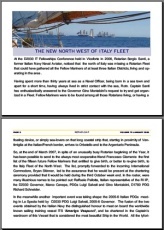 So, at the end of March 2007, in spite of an unusually busy Rotarian beginning of the Year, it has been possible to send to the always most cooperative friend Francesco Clemente the first list of the fifteen future Fellow Mariners that entitled to give birth, or better to re-give birth, to the Italy Fleet of the North West. 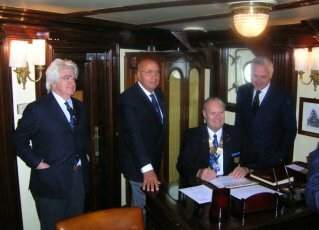 The list, promptly forwarded to the incoming International Commodore, Bryan Skinner, led to the assurance that he would be present at the chartering ceremony provided that it would be held during the third October week end. In the roster, were many illustrious names to be pointed out: Raffaele Pallotta, Italian representative of the RI IP, the D2030 Governor, Marco Canepa, PDGs Luigi Salvati and Gino Montalcini, D1780 PDG Richard Schneider. 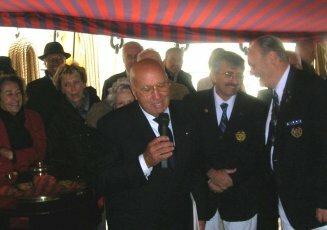 In the meanwhile another important event was taking shape: the 2005-6 Italian PDGs meeting in La Spezia held by D2030 PDG Luigi Salvati, 2005-6 Governor. 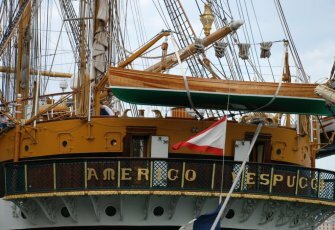 The fusion of the two events obtained by the Italian Navy the distinguished honour to meet on board the worldwide known sailing training vessel ITS Amerigo Vespucci, and be chartered in the Captain’s wardroom of this Vessel that is considered the most beautiful Ship in the World. All the Iyforians on board have been really impressed by the beauty of the Ship that, in spite being at the end of a long cruise and about to undergo the annual maintenance, could not look more perfectly shining and “ship’s shape”. The ceremony has been short but most significant. But for sure the most moved was the brand new Commodore Sergio Santi, who had had the privilege to serve on board the Amerigo Vespucci as a Naval Academy First Class Cadet in 1962, as an Officer and finally Captain, some twenty eight years later. But this is not all: some components of the new Fleet’s bridge had just had the lucky chance to be on board of the Brigantine "Italia" during the last Tall Ship Race. The Vessel’s main mission is very much similar to one of Rotary’s main targets: to help needy people suffering from uneasiness, discomfort, physical and psychophysical problems, by letting them and their families live an experience at sea, that never could be done otherwise. Things are now in progress and the dream is to get together with all the other Italian Fleets in order to help this beautiful Brigantine to perform her precious mission at her best. Least but not last: the Ship, showing the IYFR Pennant, would find in any port in the world, new, situation conscious, cooperative friends, ready to serve: all the Rotarian Mariners and their Clubs all around the world; is it not this one of our primary functions? 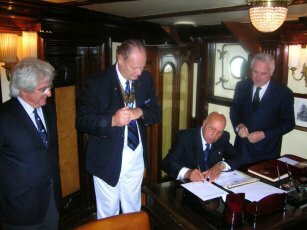 If all the Italian Mariners should succeed in leading their respective Clubs in this unusual way of creating fellowship and goodwill, well, the dream would really have come true. 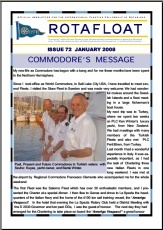 Three cheers and fair winds to the IYFR and to the new Fleet!